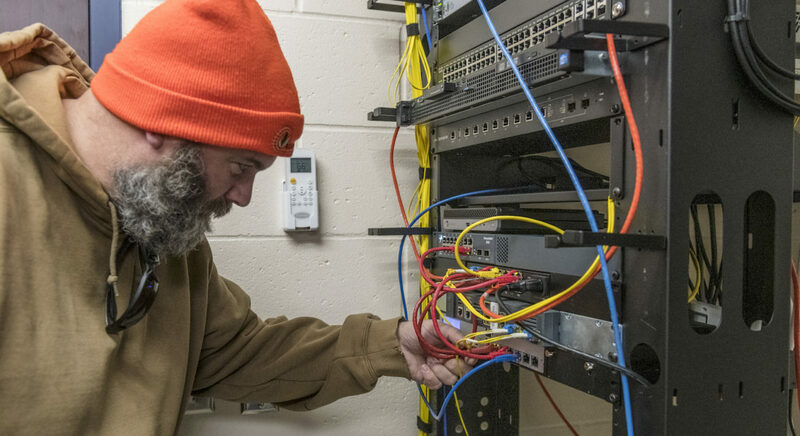 Tristan Johnson, owner of Wireless Data Net, shows where his system links into the fiber at Blue Ridge High School in Farmer City, Illinois, on Tuesday, November 13, 2018. Wireless Data Net is based out of Saybrook, Illinois, and serves just under 1,000 customers throughout 20 smaller rural towns in central Illinois. The company puts its towers on grain elevators and water towers to reach internet customers through its wireless network. But little has been done since. The public comments that began in July contain at least 3,600 references to criticism of the standards, including that speeds would would not be fast enough and that it focused on speed and not bandwidth. Secretary of Agriculture Sonny Perdue, speaking at a USTelecom Broadband Investment Forum on October 18, said the USDA’s Rural Utilities Service is still determining how internet providers will get funding for the program in which parts of rural America. “This funding is premature, as the Consolidated Appropriations Act, 2018 recently provided $600 million for a "pilot" grant/loan program, which USDA is still working to implement,” said Mulvaney in the letter. Sarah Sorrell of Fredericksburg, Virginia commented that, although she lives within five miles of a high school, she doesn’t have reliable internet access, which she needs as a college student. Map: FCC Fixed Broadband Deployment. The FCC compiles internet coverage data from service providers. Explore coverage by searching for a specific county. “The speed is not fast and it's prohibitively expensive but it's something,” said Stough. Sean Markis of Tempe, Arizona lays out a scenario in his comment that highlights the need for keeping costs down.